Jonas of Bobbio was an Italian monk, author, and abbot, active in Lombard Italy and Merovingian Gaul during the seventh century. He is best known as the author of the Life of Columbanus and His Disciples, one of the most important works of hagiography from the early medieval period, that charts the remarkable journey of the Irish exile and monastic founder, Columbanus (d. 615), through Western Europe, as well as the monastic movement initiated by him and his Frankish successors in the Merovingian kingdoms. In the years following Columbanus’s death numerous new monasteries were built by his successors and their elite patrons in Francia that decisively transformed the inter-relationship between monasteries and secular authorities in the Early Middle Ages. Jonas also wrote two other, occasional works set in the late fifth and sixth centuries: the Life of John, the abbot and founder of the monastery of Réomé in Burgundy, and the Life of Vedast, the first bishop of Arras and a contemporary of Clovis. Both works provide perspectives on how the past Gallic monastic tradition, the role of bishops, and the Christianization of the Franks were perceived in Jonas’s time. Jonas’s hagiography also provides important evidence for the reception of classical and late antique texts as well as the works of Gregory the Great and Gregory of Tours.This volume presents the first complete English translation of all of Jonas of Bobbio’s saints’ Lives with detailed notes and scholarly introduction that will be of value to all those interested in this period. The Life of Columbanus is a, perhaps the, central text for the history of seventh-century monasticism. The first book of the work describes the career of the Irish monk Columbanus, while the second describes his disciples - Eustasius, Athala and Burgundofara. It is a well-known text and has been translated into several languages, including French and Italian. An English version of Book I is in print, as is a translation by Professor Ian Wood of part of Book II. There are, however, good reasons for a new translation and commentary, and not just because the text is a central one. First, Columbanus died in 615: 2015 will therefore be a centenary year. Second, the current translation of Book I does not use the latest (1965) edition. Third, recent archaeological discoveries at Luxeuil, Columbanus’ most important foundation in Francia, have revolutionised our understanding of the saint’s actual impact. Whilst Jonas describes the site as an unoccupied desert, in reality it was a thriving cult site surrounded by major cemeteries which were already in use before Columbanus’ arrival – as has only become apparent in the last five years. This means that the text now has to be seen as a programmatic work, advocating a particular monastic style, rather than as a record of fact (a point that is not new, but which has been disregarded by many scholars). Moreover, while it is a programmatic work advocating a particular style of monasticism, since the 1970s it has become a good deal more apparent to what extent that style was novel, and to what extent it was merely the refinement of monastic practices already present before Columbanus’ arrival. Equally, it is becoming clear that some of the practices ascribed to Columbanus by Jonas reflect developments following the saint’s death, which the hagiographer wished to associate with the founding saint. As a result, the commentary on the text will in many ways be as important for students as the translation. The Life of John of Réomé, also written by Jonas, is a short work which promotes the same values as are present in the Life of Columbanus, but which are here ascribed to an earlier Gallo-Roman saint. It is an important text, because it adds to our knowledge of the monastic movement to which the Life of Columbanus belongs. 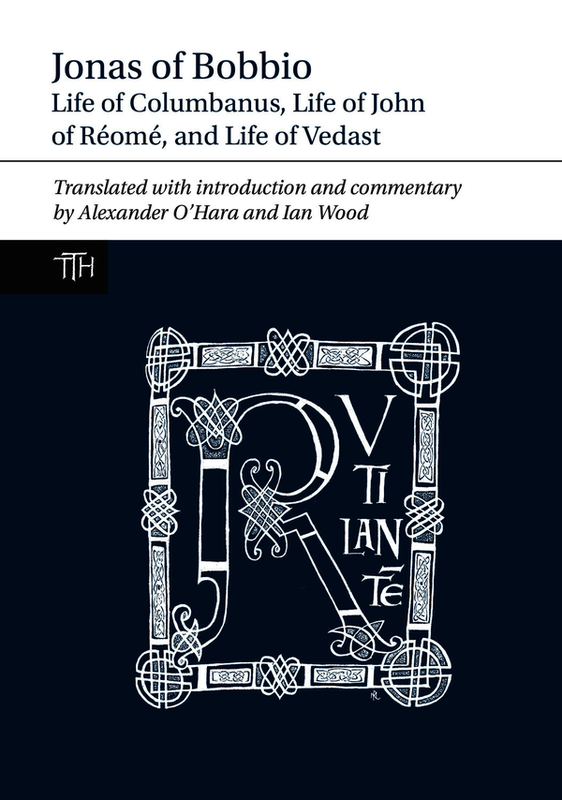 The Life of Vedast is also included in the volume for completeness. It was identified in 1905, as being by Jonas and although this has been questioned in recent years, the objections are not decisive. The text unquestionably belongs to Jonas’ circle, even if he himself did not write it. Columbanus died in 615: 2015 will therefore be a centenary year. The Life of Columbanus is a well-known text, but the current English translation of Book I does not use the latest (1965) edition by Michele Tosi. Recent archaeological discoveries at Luxeuil, Columbanus’ most important foundation in Francia, have revolutionised our understanding of the saint’s actual impact. As a result, the commentary on the text will in many ways be as important for students as the translation. The Life of John of Réomé is an important text, because it adds to our knowledge of the monastic movement to which the Life of Columbanus belongs, and has not previously been translated into English. Alexander O'Hara wrote his doctoral thesis on Jonas, and has published three papers on the subject. Ian Wood is considered to be the world expert on the text. Dr Alexander O'Hara is a Research Fellow of the Institut für Mittelalterforschung in the Austrian Academy of Sciences and an Hon. Research Fellow of the School of History, University of St Andrews. Professor Ian Wood is Professor of Early Medieval History in the Institute for Medieval Studies at the University of Leeds. His research interests focus on the history and historiography of the early Middle Ages. Previous publications include Avitus of Vienne: Letters and Selected Prose (TTH, LUP, 2002).